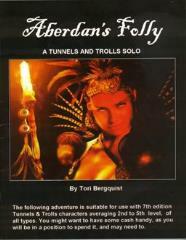 The following adventure is suitable for use with 7th edition T&T characters, averaging 2nd to 5th Level of all types—although the scenario does assume you are playing a male character... or a very masculine gal, ahem. Have some cash handy, as you will be in a position to spend it, and may need to do so. This adventure is set in the world of Lingusia, primarily in a northern region of the Amech jungle, along a stretch of great mountains known as Aberdan's Folly, named after an explorer who entered the range and never returned. The scenario opens in a small river kingdom to the north of the region, called Covarte. This new full-sized solo is 52 pages in length, with beautiful full-color front and back covers.